Hello and welcome to the MINIME MINIATURE HORSE FARM! My name is Becky Rogers and I live in the beginning of the beautiful Ozarks and close to the Elk River. I live up & around the beautiful bluffs that surrounds Noel and the outlaying areas and in the warmer months it is very beautiful here. The town "NOEL" is famous for it's name and is called the Christmas town during the Christmas holidays and thousands of hand posted Christmas cards go through our post office during that time! I just started collecting my foundation stock 7 years ago. It has been a long and slow process, but I do love being around the miniatures! They are so intelligent, very easily trained for just about anything! I find that the miniature horse is not as flighty or spooky as are the big horses which I have been around since I was 6 yrs old. I raised, bred and trained horses for many years. I bred for the Arabian Pinto. But unfortunately the big horses just got to be too much and I decided to go into the miniatures - and don't regret one minute of it! CURRENTLY we have 2 mares in foal. As the foals are born pictures will be posted and the prices for the babies will be put up. If you see anything that you like - Please give me a call: 417-475-6273. A few of our mares will be for sale or trade also after foaling. Once the foals are weaned I will have 2 broodmares up for sale or trade. FOR 2017 WE WILL BREED TO A LIMITED NUMBER OF OUTSIDE MINIATURE OR PONY MARES. Mares from outside of state will need a current coggins. 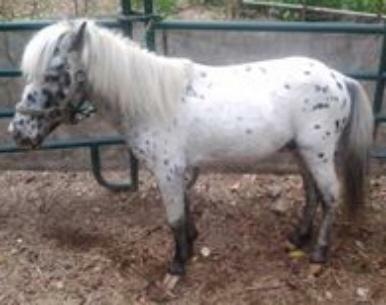 Breeding fee for for appaloosa stallion is $125 breeding fee plus a $6 per day feed/hay fee (unless owner furnishes). Mares will be hand bred - no pasture breeding. This is for 2017 ONLY. Fees will go up after 2018. This gorgeous hunk is our 8 yr old leopard appaloosa stallion "PAWNEE'S APACHE SCOUT". He will be used to add more color to our babies and more patterns to our little pinto mini mares for 2016. He has been bred to ALL of my mini mares.